I’ve released a package that I’ve been using for well over a year now for the purpose of writing functional test suites against applications using Postgres. The executive summary is that PGProxy allows you to write tests that are transactionally isolated from one another, without doing anything special in your application code. This project is aimed more at functional tests of a website (using something like Selenium) than it is for unit tests of a single class or module. In those cases, using mock objects or other strategies is more viable. But, you could certainly use PGProxy in those scenarios as well. You can get it on github here. PGProxy is written in Python using Twisted, and has its own extensive set of unit and functional tests. Clearly, if we don’t take any special precautions in our test suite, Test A will never succeed if it is run after Test B. And if we require that Test A always runs before Test B, then we’re forced to recreate our fixture database in between test runs. And this is just two tests—when you’re talking about thousands, the potential interactions can be huge. Not to mention that depending on big your fixture databases are, creation at the start of every run can be a pain. Restore the fixture database between test cases using something like CREATE DATABASE .. WITH TEMPLATE. Have each test be responsible for undoing whatever it does. Have each test be responsible for creating any data that it’s going to use. Don’t write tests for user “steve,” but rather locate a user in the fixture data that meets the criteria that you need. Make each test work inside of a transaction, and roll the transaction back when the test is completed. There are problems with all of these approaches. 1) is very slow. 2) is very tedious for developers and error prone. 3) is similarly tedious and can be slow, depending on how much logic creating your entities entails. 4) is really just moving the goalposts, because tests are still going to interfere with each other. 5) works to the extent that you can have all of your database access code share a connection and to the extent that your code does not try to use its own transactions. But! I am writing this to tell you about an exciting new option, namely, “do something crazy.” PGProxy is that crazy thing, and it works pretty well. As mentioned above, your test case can only work inside of a transaction if you are able to use a single connection per database per test case. If your test case is making calls to multiple processes that all want to use your fixture database, that is a pretty difficult thing to do. 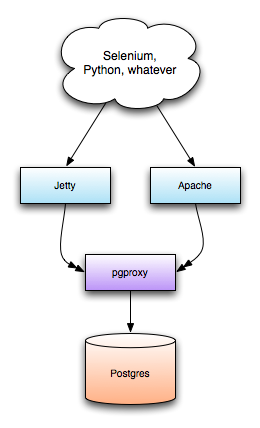 PGProxy solves the problem by, you guessed, it, proxying all of your database connections. So if you have a PHP site running in Apache and a scala service running in Jetty, they can now share database connections in your tests. And consequently, they can share a transaction. # this will shut down the proxy when the tests complete. In both of these cases, PGProxy is configured to accept connections on port 5433, and to connect to the Postgres server running on port 5432. In these examples you would tell your application to connect to port 5433. In order to run PGProxy, you need Twisted version 8.1.0 or later. # to the fixture data. Since setUp and tearDown are frequently overridden by developers for other purposes, I generally like to use a metaclass to wrap test cases in transactions instead. This way if a developer forgets to call the base test case’s setUp method, it’s no big deal for the rest of the suite. I’ll leave that as an exercise. You get the idea. Lord knows I have a complicated opinion of all things Twisted, and maybe someday I will write something about that. And by “someday” I mean I am almost certainly never going to, because I have enough trouble staying out of nerd fights on the internet. But I have to say that for this project, with the precise set of requirements that it had, and taking as a given my pre-existing wealth of experience with Twisted, things worked out great. This was a from-scratch rewrite of my first version, which was written using asyncore. The asyncore version was riddled with obscure race conditions, and it turned out to be much easier to just rewrite the damned thing using an event-driven framework than it ever was to debug the original. There was not a better choice of Python framework for this project, though I did toy with the idea of using scala. Anyway, I hope this praise for Twisted doesn’t come across as excessively faint. Enjoy! Don’t hesitate to drop me a line if you find this useful or have bug reports.